Four people accused of cutting a wire and entering an RAF base during a protest have been found guilty. The End The Drone Wars protesters were arrested at RAF Waddington in Lincolnshire in January during a demonstration over the use of armed drones. Appearing at Lincoln Magistrates' Court, the two men and two women received a conditional discharge for two years. They were also fined £337 each. The court heard how the protesters, from Oxford, Nottingham, Leicester and Coventry, had been seen by police at the south end of the runway wearing hi-visibility jackets and holding banners. The group said they had entered the base with the intent of preventing more drone strikes on innocent people. 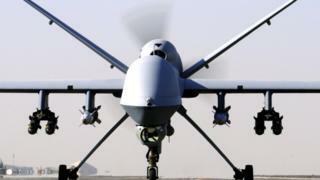 Speaking after their trial, Cole said: "The use of drones should be seen as a war crime. "We spent two days setting out our argument that RAF Waddington drones are killing innocent civilians." He said the judge told them their actions would not have prevented drone operations, but acknowledged they were "sincere and honest" in their beliefs. However, he said the judge told them "arguments about the legality of drone strikes was not a matter for this court". The defendants said they were disappointed with the verdict, but understood the reasons for it. They pledged to continue their campaign against the use of drones. The Reapers, which have hi-tech sensors and laser-guided weapons, are based in Iraq, Afghanistan and Syria but are controlled by military staff at the Lincolnshire base.